How Many Marbles Do YOU Have? The children’s book How Many Marbles Do YOU Have? may not be appropriate for everyone, but for any parent coping with chronic illness, please listen up! The author of today’s Inspiring Children’s Book Find, Melinda Malott, lives with both Chronic Fatigue Syndrome and Fibromyalgia. While she wrote this book to help children understand the limitations of these specific illnesses, the message is just as useful for any child whose parent experiences debilitating health limits. This is a first person account of a young boy who loves to play games, feed the ducks at the park, and go out for ice cream. His mother spends a great deal of time resting in bed or in her cozy chair. She’d much rather do plenty of other things instead, like spend more quality time with her son, but because she is ill her body often won’t allow her to. The boy’s mom uses a very simple system of marbles in a jar to let her family know just how much she is able to do on any given day. This not only helps her family understand what to expect, it helps her communicate how she’s feeling in a way that doesn’t rob even more precious energy from her already limited supply. Most of us know what it’s like to fall ill, for a little while at least. But when that illness decides to stick around for good, the disappointment of lost activities, abilities and experiences in life can stick around as well. Melinda Malott offers a valuable tool to help reduce some of that disappointment. Kids not only learn that simple, everyday activities cost energy, or in this case, various amounts of marbles. They also learn that some days begin with more marbles in the jar than others. Adding and subtracting marbles in a jar is a simple, concrete way to help guide family members’ expectations. Yes, that includes spouses, too! Most importantly, children learn to be grateful for the love of their parent despite how much he or she is physically able to do. 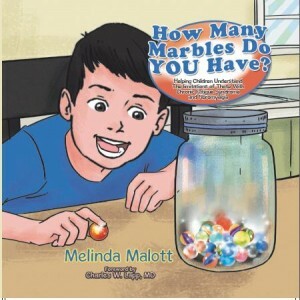 ~ Melinda Malott, How Many Marbles Do YOU Have? Side note: Depending on who you talk to these days, CFS (Chronic Fatigue Syndrome) may also be referred to as CFIDS (Chronic Fatigue Immune Deficiency Syndrome), ME (Myalgic Encephalomyalitis), or SEID (Systemic Exertion Intolerance Disease). Regardless of what we call this often misunderstood condition, I commend the author for devoting her precious energy to writing such an important children’s book. Find How Many Marbles Do YOU Have? at www.MelindaMalott.com. Want to read about more children’s books like this one? Visit the growing list of Inspiring Children’s Book Finds. Is Auditory Memory Responsible for Your Child’s Learning Struggles? Why Is My Child So Unmotivated?